Dr Melvyn Hillsdon published his first report on the subject in 2000 – the first time scientific methods had been used to report what was actually happening in clubs regarding member retention. Subsequent reports began to unravel the behaviours of members during the adoption and maintenance phases of membership, and one key element was identified: members who visited their club at least once a week in the first four weeks were more likely to remain members over the longer term. – little thought was given to the needs and preferences of the member, or to the content of the inductions beyond extending the amount of kit introduced. Having been interested in the concepts and processes of behaviour change since the mid-90s, I was intrigued to discover whether an induction process that focused on teaching the principles of behaviour change would have any effect on the lifespan of new members. A PhD requires new knowledge to be generated, adding to existing knowledge within the academic field. A search of previous research identified that elements such as one-to-one support, moderate intensity exercise, multiple appointments and the inclusion of behaviour change strategies such as Social cognitive theory (Bandura 1977) had been effective at increasing physical activity. However, none of this research had been conducted with gym goers, and this is what my study set out to do. A suitable venue to carry out this research was identified in London’s central YMCA club and, over a five- month period, 475 new members were recruited into the study. for the inducting new members, were trained in delivering the intervention that I devised. this was primarily based on the principles of Social cognitive theory, which is governed by three key factors – behavioural, personal and environmental – and states that all three will interact to create a change, and that a change in one will have an effect on the other two. to exercise, evaluation of outcome and process goals – as well as time to recap on exercise equipment. a sense of belonging and to ensure, with instructors working shifts, new members always knew someone in the club. Sessions also included an opportunity for the member to demonstrate how they had progressed between sessions. the intervention. New members were therefore randomly assigned into either a control group, who received the club’s standard, one-off 60-minute induction – still a standard procedure across the industry – or the intervention group. be about correct technique. Positive language should also be used to reinforce the achievements of the member. Our exercise programme design was also tailored to meet the individual needs of the member, with an emphasis on simplicity and low intensity in both and resistance. It’s important to ensure new members are successful in the early stages of membership, avoiding over- complex and high intensity exercises. they will gravitate to this over time if they wish. The members were followed for 12 months to observe changes in frequency of activity, exercise intensity and psychological processes – self-efficacy, outcome expectation (the belief that exercise will lead to specific benefits) and outcome values (the value someone places on achieving their goals). in Dr Hillsdon’s reports – was used to calculate the results of both induction processes. 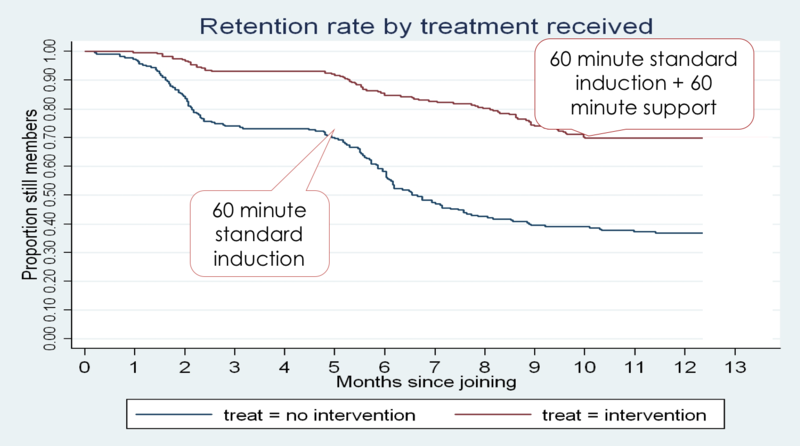 When all other factors – age, gender, exercise experience, distance travelled from home or work, and psychological processes – were taken into account, 70 per cent of the intervention group were still members after 12 months, compared with only 38 per cent of the control group (see graph p43). to identify the rate at which members left. this identified that members in the intervention group left at a rate of 24 per 1,000 members per month, compared to those in the control group who left at a rate of 77 per 1,000 per month. In both groups, over the 12 months of the study, exercise intensity rose gradually from moderate to vigorous. overall visit frequency did not increase, however, with the average weekly visits remaining at two or fewer. the first three months. However, this increased level was maintained only in the intervention group, and declined in the control group at three months. Members in the intervention group also reported increased levels of confidence in using the club and in their ability to maintain exercise in the future. It is possible to increase membership length by manipulating the induction processes. Behaviour change procedures have been shown to be effective at developing positive behaviours in fitness facilities as well as in clinical environments. using existing staff and manipulating the staff timetable, it is possible to provide additional support in the early stages of membership, which has been proven to make a significant difference to retention rates. This does not require specialist staff, but does require specialist training for your staff. All the staff delivering the intervention at the central YMCA were existing gym instructors with at least a Level 2 NVQ, plus additional training in behaviour change techniques based on Social cognitive theory. in the first four weeks provided an additional seven months’ revenue. However, while all new members should have some form of induction to introduce them to the club/fitness team, ongoing observations suggest that not all new members require the additional levels of support provided by the behavioural change induction model we tested. In the case of our study, all participants had agreed to be involved – including attending all four sessions, irrespective of their previous gym experience. However, in practice, new members who are regular exercisers and just transferring gyms may not require multiple inductions – indeed, putting them through this may have a negative effect. Limiting inductions for experienced exercisers will also free up additional time to support those new to exercise. that, while some new joiners may have been members elsewhere, they may never have got going. these are the people most likely to slip through the net when it comes to support, which happens when staff assume that previous membership equates to competence and consequently provide an induction more suitable to an experienced exerciser. also require behaviour change to be considered – already common in other industries where this is the goal. Fitness staff must also realise that the aim of the induction is to help the member to begin to use the facility with confidence and competence, not to show how much they know about every aspect of programme design.